“Share a list of books that affected you in some way. Then tag 10 of your friends, including me; so I can see your answers.” I was tagged by Jen Siems. 1. Blindness by José Saramago. This was a gift from my college boyfriend, who I mistakenly thought had read it. Whoops. It was the first novel I remember really loving. It’s dark and has the most disturbing assault scene I’ve ever read. But I think it reminded me that there was good fiction out there. For many years it was the gift I gave when I stayed with friends. 2. Atonement by Ian McEwan. I think most people think of this as that Kira Knightly movie. The book is so good. It’s frustrating and drags emotions all over the place. And there is a moment – I think those who have read it know what I mean – that nearly destroyed me. I remember reading it sitting on the floor of my apartment in NYC and shaking and crying, realizing what was going on. I haven’t read it since. 3. Never Let Me Go by Kazuo Ishiguro. It’s about friendship, and love, and a sort of strange dystopian but not post-apocalyptic world. It’s not dramatic – it feels almost muted. But it is devastating in its own way. Huh. Apparently my kind of novel is the kind that slowly screws you up a little. 4. The Bible by Various. I know. Weird for an atheist, right? But by the time I was re-reading it in college, discussing it in bible study, I had the realization that I was not only not a Christian, but didn’t believe in god. Without reading it at that moment, with that group, I might not have realized that for years. 5. Brain Droppings by George Carlin. I was never lucky enough to see him perform live, but man, this book. It’s bizarre. There are jokes that are funny only in their absurdity. But I (and my sister) can turn to any page, read a line, and end up laughing out loud. 6. Let’s Pretend This Never Happened by Jenny Lawson. Known as the Bloggess, Ms. Lawson is weird and amazing. The book is funny and sad and relatable even if you didn’t grow up surrounded by taxidermied animals. 7. A Tale of Two Cities by Charles Dickens. This is the only piece of reading (book, article, poem, whatever) that was ever assigned to me in my twenty years of education that I did not finish. 8. Fast Food Nation by Eric Schlosser. This was one of the first books I recall reading that helped me to verbalize my progressive beliefs. It got me angry, and it profoundly affected how I view corporations. 9. The Fountainhead by Ayn Rand. Another former boyfriend recommended this one. Oh god. It is so bad. Just utter crap. It’s a pretty easy litmus test for whether I’m going to get along with someone if, when I mention this book, their response is a deep shudder or an audible groan. 10. BITCHfest by Various. It’s the first straight up feminist book I read. Once I finished, I found more. And more. And I haven’t stopped. I had a fantastic week in Hawaii, but I have to admit I was relieved this morning to get out of the car at the grocery store and not immediately feel like I need a shower. – Is there a way to stop this? The Catholic Church is Managing Many Local Hospitals. How Will it Affect Your Health Care? – We have some flexibility with out work hours and it’s pretty fantastic: Yes, Flexible Hours Ease Stress. But Is Everyone on Board? I first learned about Ms. Adichie from her Ted Talk. The blurb on the back of the book, while technically correct, doesn’t adequately capture what the book is about. Americanah follows Ifemelu and her boyfriend Obinze through youth and into adulthood, but it is definitely Ifemelu’s book. The situations that Obinze faces are I suppose technically what the back blurb says, but overall I think it’s a better book than the one the blurb describes. The writing jumps around a lot – sometimes it is present day U.S., sometimes the Nigeria of Ifemelu’s youth, and sometimes it is the U.S. in between. But it isn’t confusing – each chapter quickly establishes the time and place, and it all works so well together to build a story. Usually I write all through my books, but I was just too absorbed in this to make many notes. It’s nearly 600 pages long, but I read it over the course of a week while on vacation and found that when I would pick it up I’d read 100 pages in a stretch. The story itself is more interesting and complex than a simple love story – I can honestly say I did not know how it would end until I finished the book. But it’s also fantastic because of its social commentary. The main character Ifemelu starts a blog from the perspective of a Black African living in the U.S. and navigating race in a very different way than she was used to in Nigeria. The sample blog posts are interesting and insightful, as are some really great chapters about immigration and London. It’s a well-crafted piece of writing that I hope many people choose to read. This is a book with no plot. And I don’t mean that in an insulting way – it literally has no plot because it’s not that kind of book. I found it in this great store in downtown Seattle that is filled with lotions, soaps, snacks, classic children’s toys and gift books. It’s the kind of store that groups items not by type but by packaging color. I could spend hours in there; on our first trip there I left with three books (see my CBR6 review #31), including this one. It’s basically a book of nostalgia. 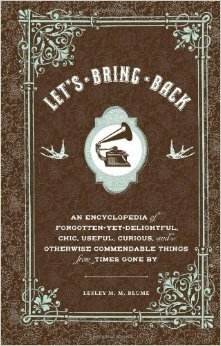 In fact, the subtitle is ‘An encyclopedia of forgotten-yet-delightful, chic, useful, curious and otherwise commendable things from times gone by.’ So yeah, a book of nostalgia. I tend to like books like this, and for the most part this one was entertaining, but some choices the author made strike me as odd. For example, included in this 250-page volume are many deceased celebrities. I get what the author was going for – let’s bring back the glamour of this actor or the whimsy of this designer, but it’s a little weird to just see a name and description of a deceased person in a book called “Let’s Bring Back.” It struck me as indelicate. The other big drawback is that a couple of things that the author wants to bring back have decidedly unpleasant connotations. On the first page the author suggest bringing back ‘all-white rooms,’ which on the surface sound kind of cool – furniture, walls, everything all the same color (in this case, white). But the example she provides is from a plantation in Louisiana. I’m not really ever going to be on board with ‘bringing back’ anything about plantations; I’m sure she could have found a different example. She also makes a snide comment about Monica Lewinsky at one point, which is unnecessary and mean-spirited. Putting the tone-deafness of these items aside, there are some genuinely fun things in this book. A few were reminders for me, even triggering an audible ‘oh yeah, we should bring that back.’ Others were just entertaining – usually for things like hot mustard mousse and other food I can’t imagine seeing on a menu these days. But a mechanical desk? Or words like ‘swell’? Yeah, I can see the appeal. Robin Williams dies. Mike Brown is unarmed and killed by the police, and the police handle it so poorly there aren’t words to describe it. It’s been a rough week. – Pajiba.com has been a great place this week – so many posts on Robin Williams, and a great one tonight on what’s going on in Ferguson. Check them out (this one is by my favorite writer over there, @courtenlow): Why Do We Personalize Celebrity Deaths? How appropriate that this is my 500th post. I love participating in Cannonball Read for a few reasons. I didn’t know AlabamaPink, but I followed her on Pajiba and am happy to support fundraising in her name. I love that CBR motivates me to pick up a book instead of a video game or magazine, and I know I wouldn’t have read nearly as many (mostly good) books in the last 18 months without it. But one benefit I didn’t fully understand until recently is that CBR gives me the chance to improve my non-fiction writing on a weekly basis. This latest read has been particularly useful with that goal. 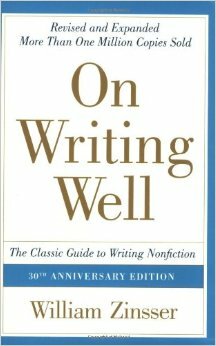 My husband read ‘On Writing Well’ and thought I’d enjoy it. It bodes well for a book that aspires to be a guide to writing nonfiction that it is so easy to read. Mr. Zinsser wrote the first edition of this book in 1976, but has updated it many times, most recently about eight years ago. It is well-organized, fun to read, and most importantly filled with fantastic advice, as my notebook filled with quotes from it confirms. A few of Mr. Zinsser’s suggestions are obvious, but that doesn’t mean most people actually follow them. One thing he pushes for repeatedly is to take a stand and remove the passive voice. Until graduate school many of my instructors required that I write in the passive voice; thankfully that changed but I still find myself having to work at using my voice in my writing, especially at work. I don’t think I’m alone in that, and it’s nice to get some advice on being even stronger with my word choice. Unfortunately, while Mr. Zinsser understands and reinforces the power of language, he seems to only allow that power in so far as he agrees with it. He mentions that he used to use ‘he’ as his generic pronoun, but feminists convinced him that such usage was sexist, and so he changed his style. He saw that not using a gender-neutral form whenever possible reinforced the idea that male is the default, and female the anomaly. But in other areas he suggests that being careful with language is just ‘political correctness’ and dismisses it. The specific example he uses – expressing his distaste for the term undocumented resident and preference for the term illegal alien – shows that he still chooses his words based on his political inclination. He sees the error in his ways on gender, but apparently not yet on nationality. That is disappointing. Despite that one (important) area where Mr. Zinsser and I disagree, I know that much of what he wrote is solid advice. Hopefully as I incorporate his suggestions my writing – for Cannonball Read, for work, and for my own blog – will improve. Or, I should say, I will improve my writing. Two birthdays this week – Arlo turned three and Lukas turned one. Happy birthday buddies! If you don’t find little, dancing Groot adorable, you have no soul. – Imgur.